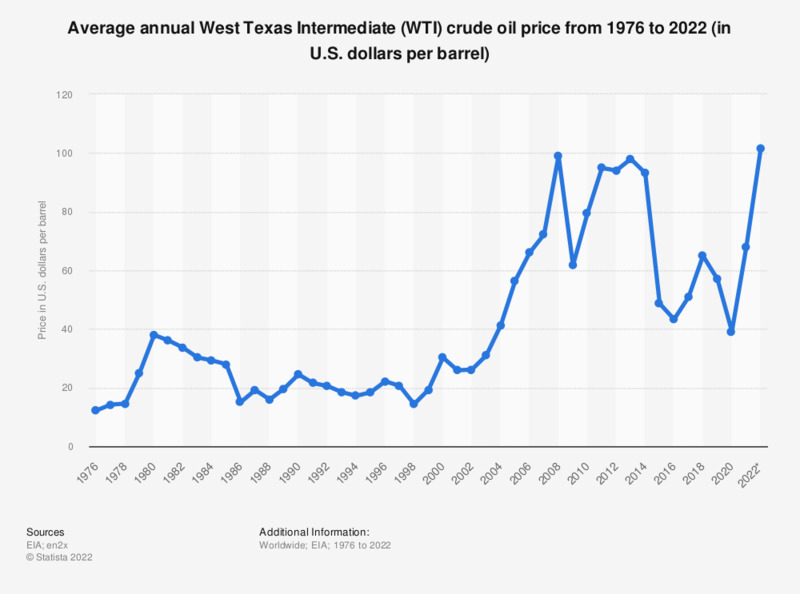 This statistic shows the West Texas Intermediate oil price from 1976 to 2019, in U.S. dollars per barrel. In 2018 the average annual price of one barrel of West Texas Intermediate crude oil was 64.94 U.S. dollars. WTI is a relatively light crude oil, also called Texas light sweet. It is used as a benchmark for oil pricing. Prices of West Texas Intermediate are often listed in oil price reports, alongside other important oil markers, like UK Brent or the OPEC basket. WTI is used as an oil pricing benchmark. WTI crude oil is also the underlying commodity of the Chicago Mercantile Exchange’s oil futures contracts. The price of other crude oils, such as UK Brent crude oil, the OPEC crude oil basket, and Dubai Fateh oil, can be compared to that of WTI crude oil. Since 1976, the price of WTI crude oil has increased dramatically, rising from just 12.23 U.S. dollar per barrel in 1976 to a peak of 99.06 dollars per barrel in 2008. The price per barrel in March 2016 was a monthly average of 33.18 U.S. dollars. The price of WTI is volatile, as a timeline of the monthly price development of West Texas Intermediate crude oil shows. The price of oil is controlled in part by limiting oil production. Prior to 1971, the Texas Railroad Commission controlled the price of oil by setting limits on production of U.S. oil. In 1971, the Texas Railroad Commission ceased limiting production, but OPEC, the Organization of Petroleum Exporting Countries with member states Iran, Iraq, Kuwait, Saudi Arabia, and Venezuela among others, continued to do so. In 1972, due to geopolitical conflict, OPEC set an oil embargo and cut oil production, causing prices to quadruple by 1974. Oil prices rose again in 1979 and 1980 due to the Iranian revolution, and doubled between 1978 and 1981 as the Iran-Iraq War prevented oil production. A number of geopolitical conflicts and periods of increased production and consumption have influenced the price of oil since the 1980s.